Slaughterhouse: Exposé of Kosher Slaughter in the U.S. 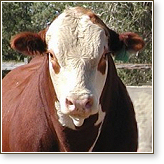 Originating in England during the 18th century, the Hereford dominates selective development of beef cattle. The Hereford breed was prized for its hardiness and weight, with its fat-laced flesh, and eventually bred to weigh over 1,400 kg (3,000 lb). After the industrial revolution, breeders responded to growing demand for more beef by enlarging their herds and developing heavier and fatter cattle. Other popular European foundation stock are the Angus and the Belgian Blue. However, today's consumers insist on leaner beef, and over the past few decades breeders have met these demands by reshaping classic beef cattle into smaller and leaner animals, quick to reach saleable weight within 15 months. This trend has been duplicated worldwide as many countries adapt their herds to intensively confined, feedlot farming systems. Expansion of the meat industry has been particularly strong in Asia and in South America. The ten most productive countries in the world, in order, are: the U.S., Brazil, the EU, China, India, Argentina, the Russian Federation, Australia, Mexico, and Canada. There are approximately 1.5 billion cattle alive in the world today, all traveling a direct road to a slaughterhouse and a rendering plant. Wherever their life starts, young male beef cattle will be vaccinated, then branded, castrated, and dehorned. Females are vaccinated and branded. The calf is thrown to the ground and tied with a rope or restrained in a metal crate, called a “crush” or “cradle,” for these procedures. Branding is the burning in of a logo with a fire-hot iron for identity. More popular in Israel, an alternative branding technique uses freezing to sear through the fur and leave a scar. Branding is extremely painful, done without anesthetic, and repeated at each change of ownership. University studies show that however the young calves are restrained, both systems of branding are so traumatic that alternative approaches, like using microchips, should be substituted. All cattle are castrated at under a year old, and very often within their first 10 days. Castration assures the cowhands of an easily managed and more docile herd. In addition, the young males will put on weight more quickly and be ready to ship to the slaughterhouse sooner. Farm workers (usually not veterinarians) remove or crush or slice open the calf's testicles, using devices that cut off the blood supply with tight rubber rings, crush the spermatic cords and testicles with vise-shaped hand tools, or cut open the scrotum and remove the testes with a knife, leaving a gaping wound for drainage. Anesthetics and painkillers are expensive and never used. The pain and trauma of castration puts calves under such stress that their health is compromised and susceptible to infection. The enormous size of a typical herd means that aftercare is non-existent and critical animal-welfare issues like pain, bleeding, and infection, simply cannot be addressed. Therefore, mortality rates are high. To maximize the value of their final product, cattlemen dehorn stock to avoid bruised meat that might be condemned for human consumption, to minimize damaged hides, and to make handling easier when cattle are crowded on trucks or confined in feedlots. Depending on the age of the animal and local preferences, cattle are dehorned using a variety of instruments. A caustic stick or paste is applied to burn off the horn buds, or a hot electric debudding iron is used to destroy the horn-forming tissue in very young calves. In others, a number of gouging and cutting implements are used to chop out the horn area, leaving an open wound and sometimes a fractured skull. For cattle with grown horns, a worker will have to use a hacksaw or cutting wire. Animal protocols in many countries recommend mixed breeding to eliminate the need for dehorning. Naturally polled (hornless) cattle like the Angus, Friesian, or Holstein breeds, carry a dominant gene and produce young without horns. Alternatively, dehorning young calves using an anesthetic such as lidocaine blocks the nerve successfully and avoids suffering. Some cattle still live for a few months on a range, a vast tract of open land, usually publicly owned. They can graze on scrub before being rounded up and trekked to rail stations, or truck collection-depots, to be transported great distances to the fattening yards called feedlots. Those ranges are now overgrazed, the soil depleted, the river banks trampled, and the water polluted. After more than 100 years of overuse, these huge stretches of land are no longer habitable for native species. It was the expansion of railroads that made it possible to link the great steppes of the American West to slaughter centers like Omaha and Chicago. Similarly in Europe, the building of railroad networks served as the foundation for a continental beef industry. Freight trains with endless cattle cars deliver terrified and exhausted animals to their death. At the feedlots, all cattle are eventually gathered and fattened before killing. They will spend their last few months shuffling around in dirt pens with no relief from excessive heat and cold. The paddocks extend as far as the eye can see. To add weight quickly, their diet is changed to grain and pelleted feed that is mainly comprised of manure from broiler chicken sheds, ground-up fish meal, sawdust, and processed animal parts. Minimal nutrition is managed through supplements in the feed and other additives like hormones, while veterinary care is substituted with preventive dosing of antibiotics. While in the crowded yards, cattle are prone to tick fever, buffalo fly, bovine herpes virus (BHV1), bovine respiratory disease (BRD), acidosis, feedlot bloat, liver abscesses, sudden death syndromes, botulism, and pink-eye. Lameness in the feedlot is common and caused by toe abscesses, injury to the hoof, footrot, swollen joints, broken bones, and muscle damage. With barely a caretaker on the grounds among tens of thousands of animals, and rarely a veterinarian, attention is never directed at serving a medical need. The race is to deliver the animal while still standing and able to walk to the kill line at the abattoir. Waste management has become a serious issue because the disposal of urine and manure is impossible to resolve safely, and local populations no longer tolerate the severe environmental impact like the pollution of the water table. In the last decade a few very large companies have bought and consolidated most of the independent slaughterhouses, making long distance travel the rule for all cattle. They arrive dehydrated and weak in the hot weather; in the winter they can succumb to pneumonia and even reach there frozen to the metal sides of the trucks. Some will break their legs during the trip. Those who can't walk are chained and dragged off, thrown on a pile in the yard, and left to a lingering death. At night, the dying animals are sometimes sold into an illegal black market of dealers who deliver the questionable butchered meat to local restaurants. It doesn't matter if it's downed cattle and diseased; it's served as "fresh beef." Cattle are driven from holding pens into channels and ramps designed to minimize resistance and maximize cooperation. This is a characteristic of the theoretical "humane slaughter" approach implemented at about half of the newest facilities. Deregulation across the industry has allowed for much faster kill speeds, about one every ten seconds, therefore the reality is that line workers are under constant pressure to quickly move the animals up the ramps and onto the killing floor. Humane standards, guidelines, and anti-cruelty laws are thrown aside while the animals are beaten with pipes or hit with electric prods — even in their faces, eyes, and their anuses — to get them to continue forward. If they fall or are wounded, they are chained and dragged on. When they bellow and challenge the workers, they are beaten again. Under no circumstance will supervisors allow the line to slow down or stop, because any delay affects the profit. All through the process normal body functions don't stop, and the cattle continue on walking in their own urine, defecating on one another, and even giving birth. Workers must keep up with the conveyor systems, which is impossible to do and still kill efficiently. The cattle enter a restraining aisle and their heads are trapped in a box for stunning. Using an air pressure stunner, or captive bolt gun, the powerful impact is meant to make them unconscious. The worker often misses and makes repeated attempts as more animals move forward. A worker wraps a shackling chain around one leg and connects it to the moving overhead conveyor, hoisting the animal into the air. The "sticker" (the person who slits the throat for bleeding) should be killing an animal that is unconscious. Very often, however, the sticker is actually slashing at a completely awake and struggling cow. A bucket is placed to collect the blood or it drains below to a catch basin. If it hasn't been started before, the face skinning process proceeds as the cow is bled. Ears and other head parts, and the feet and legs, are cut away. An animal might disengage from the chain above and fall onto a worker or into the filth below. (According to the Unions, animal slaughter is the most dangerous job in factory work today.) At any point in the rush, a task might be skipped, which is why cattle are sometimes discovered still alive even after they have been stunned and partially bled. Workers and inspectors have reported, and video footage confirms, animals are found trying to survive even as the butchering process starts when they are split in half. The objective of the cattle trade is to manage the entire process from breeding to the feedlot and through the slaughterhouse to the optimum end point — a high profit margin. It comes down to cost of gain. That's the bottom line.